The Northern Lights Will Appear Over the U.S. Tonight. Here's How to Watch. It may not reach as far south as Monday night's impressive display, but for the second night in a row, the northern lights will appear over parts of the United States. 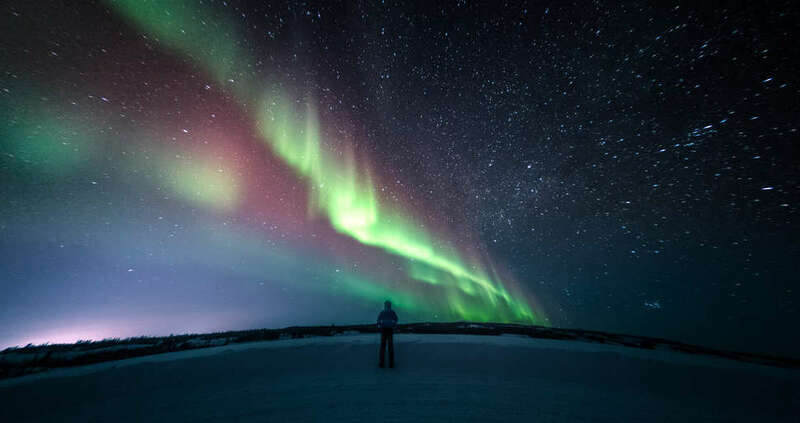 The Space Weather Prediction Center (SWPC) has a geomagnetic storm alert for the night of Tuesday, September 11, which indicates an increased possibility of catching the bucket-list spectacle. During Tuesday's event, the brilliant display could find its way as far south as the green line on the below map from the SWPC, issued for Monday's G2 geomagnetic storm watch. Far fewer states get to join in the fun Tuesday night, but you may be able to catch the display in parts of Montana, North Dakota, Minnesota, Wisconsin, Michigan, and Maine, as well as Alaska, where the aurora isn't that uncommon. Additionally, in Canada, you'll be inside the aurora dome if you're in British Columbia, Alberta, Saskatchewan, Manitoba, and northern provinces, as well as most of Ontario and Quebec. 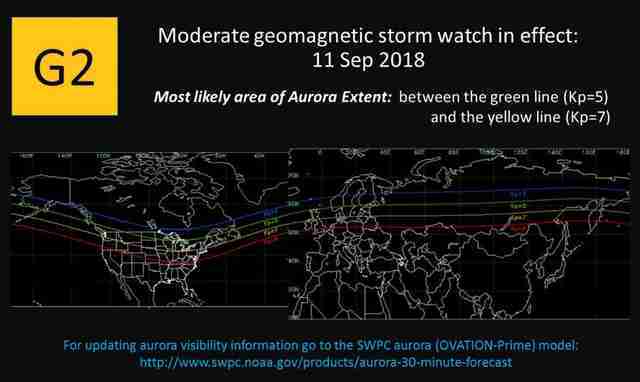 The video above shows the aurora borealis over the Mackinac Bridge in Michigan earlier this year following a G1 watch from the SWPC. Under these circumstances, you might not have the intense brilliance you'll find in, say, Iceland, but it's nonetheless an impressive show. Per the SWPC's 3-Day Forecast tool, there's a G2 alert from 5-8pm EST. A G2 alert would bring the aurora as far south as the yellow line on the above map, covering 19 states, but it'll be too early and light out for that to have any impact on your ability to see the aurora. From 11pm-2am EST there's a G1 alert, which will cover the states mentioned above. Despite the obvious joke that you should look up to see the northern lights, it's not quite that simple. At least, it's not for most people in the US. You'll need to get far from the light pollution of urban centers in order to see the show. An SWPC representative previously told Thrillist, "You need very clear skies, a good view of the northern horizon (no trees, buildings, or hills), and it needs to be dark." You'll need that view of the northern horizon because, unless you're somewhere like Alaska or Iceland, the lights will be seen along the horizon rather than directly overhead.